This is some of the video footage from our Eishin-ryu Kuden Event for the month of December 2011. In the training of this event we looked at the basic fundamentals of Japanese swordsmanship and the samurai method of iaijutsu. Eishin-ryu Iaijutsu is one of the 7 Warrior Traditions of the Budo Ryu; School of the Warrior Way as the training goes in depth within the 7 traditions of the Budo Ryu Ninjutsu Dojo! In this training event we looked at the Kodachi (小太刀) or short sword fighting skills from the Tenjin-ryu (天神流) and the Tomo-ryu (戸猛流). We also looked at many of the kata from the Togakure-ryu Shinobigatana (戸隠流忍刀). Towards the end of the training session we looked at various methods of Iaijutsu (居合術) with the Kodachi (小太刀). I hope that you enjoy the video, thank you all for your support! Take Care, Be Safe & Good Luck in your Journey of Budo. War is Chaos at Best, this was the artistic expression that was used when making the video, Chaos. I hope that you all enjoy the Tomo Ryu Shinobijutsu Video Promo! Iaijutsu (居合術), often translated roughly as the “art of mental presence and immediate response”, is the Japanese martial art of drawing the sword. It is unclear exactly when the term “iaijutsu” first came into use, or when exactly drawing the katana from its scabbard first became practiced as a discrete martial art. Iaijutsu was developed for the specific combative purpose of defending oneself, not on the battlefield, but in everyday life. So one can understand this as “self-defense” in the feudal era. 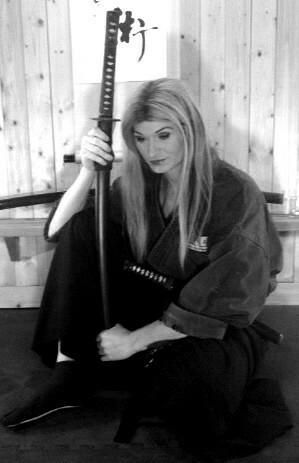 In the Budo Ryu Ninjutsu Dojo, 1 of the 7 Traditions taught within the training halls of the Budo Ryu Ninjutsu Dojo is Muso Jikiden Eishin Ryu Iaijutsu (無双直伝英信流居合術). Eishin Ryu Iaijutsu is a koryū sword art, and one of the most widely practiced schools of iaijutsu in the world. Often referred to simply as “Eishin-ryū,” it claims an unbroken lineage dating back to the sixteenth century. There you can get more information on the school and the 7 traditions that are taught under the direction of World Martial Arts Hall of Fame Anshu Christa Jacobson.